This beautiful 1988 Porsche 911 Carrera arrives in excellent condition inside and out with 49,313 well cared for miles. 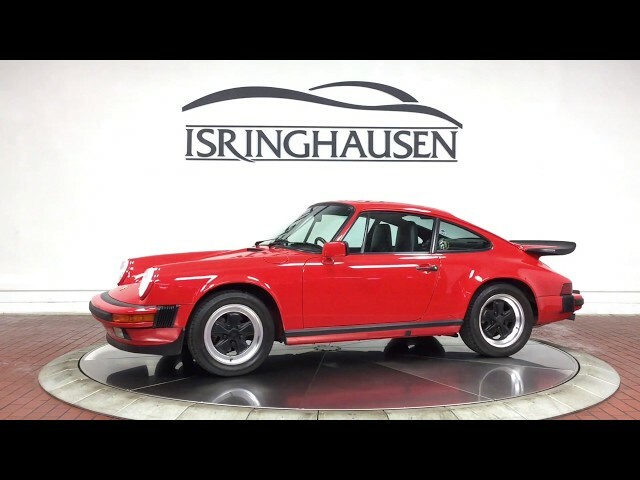 Finished in classic Guards Red with Black Leather interior and highly desirable sport seats, this nicely configured 911 adds factory short shifter, sunroof, locking diff, original Blaupunkt "Reno" Radio and more. With it's smooth shifting G50 transmission, this fantastic 911 is an excellent example of why air-cooled 911's have continued to increase in value. As a factory authorized Porsche dealer, this 911 has been fully inspected ensuring it meets the highest of standards moving forward. To learn more on acquiring this vehicle, please contact a Porsche sales specialist today by calling 877-362-9715. Isringhausen Imports is Central Illinois' premier new car, used car and certified pre-owned (CPO) dealership for quality BMW, Porsche, Volvo and Mercedes-Benz vehicles. At Isringhausen Imports, we have become a leader in the industry by working each day towards the greater good of our customers, our fellow employees, and our community.